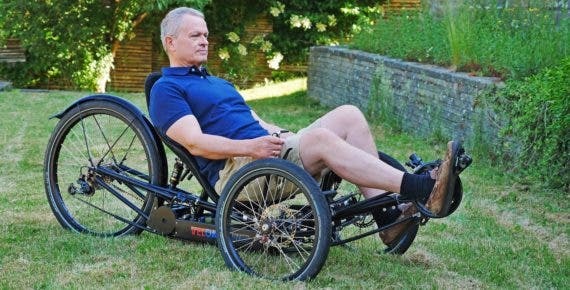 In an article in Ingeniøren I learned that engineer Lars Oksbjerre had made the bold decision to bring a novel design of a fully electric trike (3-wheeled bike) to production. A few iterations of the tadpole style design has resulted in a bike capable of extreme long-range electric assisted trips on any surface and under any condition. The low center of gravity, full suspension, and large fat tires, along with the comfortable padded seat, proves for a pleasant ride — for hours. I reached out to Lars to learn more. This is by far the most extreme range I have heard of on a bike. My own long-wheelbase with a 1 kWh Li-polymer battery has a range of about 100 miles at 20 mph, but the VELOKS MK3 can be fitted with a 4 kWh battery pack, thus extending the range to an insane 400 miles! That’s my own daily commute for 10 days straight without charging! 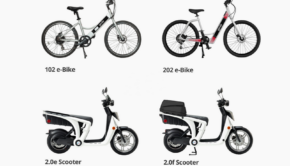 When I was in the e-bike business, people would often ask me about the range of the bikes, and I would often ask back: “how long till you get a sore behind?” Because that’s actually my biggest problem with e-bikes these days — the pain kicks in long before the range anxiety. But on a trike you virtually lie down. At a base price of €5,340 you get version 3 (MK3) of VELOKS’ full suspension electric trike with a 100-mile range. The motor will assist up to near 16 mph using a torque sensor measuring the rider’s pedaling effort. The bike weighs in at 38 kg with the standard 1 kWh battery. To get the full 400-mile range you’ll need the 4 kWh battery which adds 10.8 kg and €970 to the package. This 3rd generation design (MK3) is based upon Lars’ own experience of riding more than 10,000 miles on previous designs. The reclined seat, the suspension on all three wheels, the motor support, is all optimized for a comfortable, easy, and safe ride. Bicycle rules are much too limited. The rule of pedal assist limit of 16 mph should be removed. In effect a 250 Watt continuous power from the motor would result in cruising speed of about 20 mph. As a speed pedelec with a speed limit of 30 mph the bike is perfect and I don’t think riding on bike lanes would be a problem outside the towns and cities. Racing bikes go even faster. Everyone has to pay attention to traffic as a general rule. You could choose to apply speed limits for all bikes in city traffic. Today we have no speed limits for regular bikes, other than the general limits, and that’s ok, but those rules should apply to e-bikes too. The motor power should only be limited if you don’t have a driver’s licence. If you have a driver’s license there should be no power limit. Cars don’t have power limits. I guess there some logic in that, as long as the hardware is capable of steering and braking at more power and speed. The low ride height is not a problem. I used a flag the first year, but since it made no difference I stopped using it. You have to pay special attention to cars and trucks turning right, but the risk involved is no different from a normal bike. Indeed. Those right-turn accidents are brutal. I cannot stress this enough: whatever bike you ride, please pay attention to vehicles making turns in front of you. On a bike you are tiny-looking and easy to miss. I have done a lot of e-bike conversions over the years, and one thing that’s always a tricky issue is the torque sensor, that is, if it has to be a street legal e-bike in most of the EU. It would be easy enough to just mount a thumb or wrist throttle, but that makes it a motorbike and regulations and required approvals go off the charts. The torque sensor measures the force you apply to the pedals and feeds electric power to the motor accordingly. 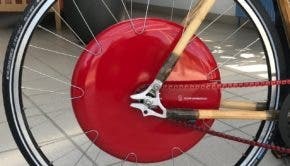 When this works smoothly you feel the powertrain as an extension of your own body. When it does not work in a perfect manner it can be the most annoying thing. Not to be confused with a crank motion sensor that just detects motion but not force and thus not very smooth. More than once I have given up on adjusting torque sensors and just put a throttle on the handlebar. Quality is key. 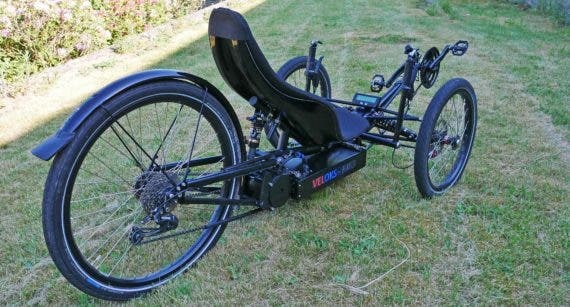 The trike is designed bottom-up for electric drive, and supports long distance rides in any weather on any road, therefore all components have to be rugged and durable. The torque sensor in this setup is cleverly built into the crank and as such is shielded from water and dust. The motor is a brushless type at 3000W, 60V, 50A, from Cyclone, with peak torque at 100 Nm. It has up to 90%. efficiency and a planetary reduction gear ratio of 1:6. Motor weighs 4.1 kg, has 13 teeth on the shaft, and 21 teeth on the 26 inch rear wheel. Gearing is designed for a top speed of 40 mph at 60V. Motor controller is an upgraded BAC Ne 800 from Accelerated Systems Inc.
All electronics are built into the waterproof battery box that can be swapped in 5 seconds. Apart from the 18650 Panasonic lithium cells it contains the BMS, motor controller, DC-DC converter (12V and 5V for lights and phone charger). Remote controlled on/off, motion sensor, geofence alarm, speed alarm, real-time tracking, power setting). The battery is designed to supply 12kW of continuous power. The “rider” drivetrain can be configured with all types of gearing like standard external gears, internal Nuvinci CVT, Shimano Alfine, Rohloff, etc. This trike was designed as an e-bike from the ground up. Battery and motor components are mounted as low as possible to ensure maximum stability. The frame and steering are designed to accommodate battery capacity up to 4 kWh and motor power up to 3kW. I only tried an electric trike once, and even though it was a conversion from a trike that was born as a muscle machine only, it was a ton of fun. Lars offers test drives. If you have a chance, try it. You won’t regret it! All images by Lars Oksbjerre.